Rock Resurrection Art : Mega Glitter Guitar Pick Earrings! Mega Glitter Guitar Pick Earrings! After tons of somewhat messy experimentation with glitter I have created 4 new pairs of mega glittery guitar pick earrings! I've created some of my own glitter polish and discovered the awesomeness of duo-chrome paints. "Rockin' Ruby Slipper Red" Guitar Pick Earrings painted with red glitter polish that I created. Front features ivory music note on red glitter with a solid glitter backside. "Glam Composition Book" Guitar Pick earrings with glitter and stripes on the back. 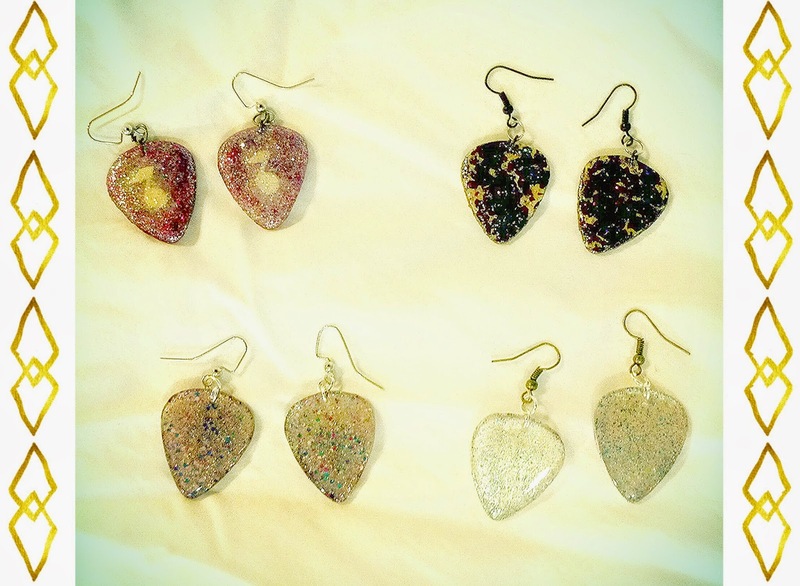 "Mega Glitter 1" Guitar Pick Earrings made with transparent picks and several layers of different types of glitter. "Mega Glitter 2" Guitar Pick Earrings made with transparent picks, several layers of different types of glitter including some light duo-chrome paint.